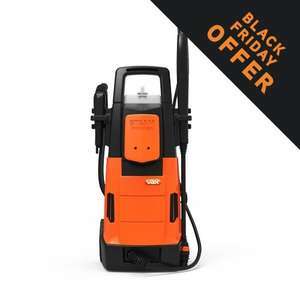 The Vax PowerPlus Steam 2000w pressure washer uses steam and washer pressure for a hygienic outdoor clean. It’s ideal for your outdoor table, children’s toys or to break down grease and grime on your BBQ. I bought it.. for my son, as I am tired of him taking ours. I have a variety of Vax products and I have only had occasion to return one item, and they sent me back - the model up - at no charge. I've not tried their powerwashers before.. so I am happy to take a chance on it for 50 notes - nice find thanks for posting. That's a brilliant deal, I have a Vax pressure washer for home, it replaced a Karcher that broke after two years. The Vax is much more powerful, and is guaranteed for six years! Oh yes, and it was half the price of the Karcher. I have just bought the above unit for my workshop. Power tools, grrrr!! Product page says 2 year warranty. The Vax is much more powerful, and is guaranteed for six years! "It’s ideal for your outdoor table, children’s toys or to break down grease and grime on your BBQ." Normally adverts go overboard about the items capabilities - cannot accuse Vax of that ...... a pressure washer which is ideal to clean your kids toys for goodness sake - doesn't bode well for being powerful enough to clean a car ! Oh yes, sorry, 2 years. Must have been thinking of the guarantee on their carpet cleaners. Still a stonking deal though! "It’s ideal for your outdoor table, children’s toys or to break down gre …"It’s ideal for your outdoor table, children’s toys or to break down grease and grime on your BBQ. "Normally adverts go overboard about the items capabilities - cannot accuse Vax of that ...... a pressure washer which is ideal to clean your kids toys for goodness sake - doesn't bode well for being powerful enough to clean a car ! Can we use the steam clean feature for stuff like kitchen cabinets, windows etc? Can we use the steam clean feature for stuff like kitchen cabinets, …Can we use the steam clean feature for stuff like kitchen cabinets, windows etc? It's worth noting that you won't get a pressure washer type performance with steam. It is a pressure washer and a steam cleaner, not simultaneously (the power consumption being only 2000W should tell you that). Just in case anyone orders this to use indoors- here is the first line of the description!!
" The Vax PowerPlus Steam 2000w pressure washer uses steam and washer pressure for a hygienic outdoor clean"
and "2000 watt pressure washer for a great overall performance"
Oh Gawd! !Just in case anyone orders this to use indoors- here is the first …Oh Gawd! !Just in case anyone orders this to use indoors- here is the first line of the description!!" The Vax PowerPlus Steam 2000w pressure washer uses steam and washer pressure for a hygienic outdoor clean"and "2000 watt pressure washer for a great overall performance"
From the reviews " the steam is separate from the pressure wash, it does not use hot steam under pressure like some commercial type cleaners." From the reviews " the steam is separate from the pressure wash, it does …From the reviews " the steam is separate from the pressure wash, it does not use hot steam under pressure like some commercial type cleaners." I can live with that link to reviews? Don't use distilled water then. function, to sanitise toys. The pressure wash function is different and is what you use to clean cars or patios etc, and is easily powerful enough. Anyone else struggling with the website? Can't check out. I bought it.. for my son, as I am tired of him taking ours. I have a …I bought it.. for my son, as I am tired of him taking ours. I have a variety of Vax products and I have only had occasion to return one item, and they sent me back - the model up - at no charge. I've not tried their powerwashers before.. so I am happy to take a chance on it for 50 notes - nice find thanks for posting. Haha... end of the day he is your own blood doesnt matter if he takes it or not. Hmmm...steam cleaning car engine bay? Is this safe to use on your car ? Thanks OP. I just ordered one. I bought a Karcher pressure washer (the K2 basic) the other day for £45 from Tesco which comes with a few accessories, but think I'll be returning that one because this seems more powerful and I need it mainly to clean the outside decking so the stronger the better I think. Much better then the k2 its the flow rate and 100 bar pressure will clean most things tbh it’sThe same level as the k4 if not better as you get the steamer. Heat. Ordered. Gonna send back that cheap blank & decker to tesco... It's rubbish. Ordered on the desktop site as the mobile site hadn't been working for me all day. Used to get my £2.50 Quidco bonus as well. anyone got notofication of dispatch yet says still processing? No notification, just turned up today.